Not to be confused with Western world or Western European Union. Western Europe is the region comprising the western part of Europe. Below, some different geographic, geopolitical and cultural definitions of the term are outlined. Significant historical events that have shaped the concept of Western Europe include the rise of Rome, the adoption of Greek culture during the Roman Republic, the adoption of Christianity by Roman Emperors, the division of the Latin West and Greek East, the Fall of the Western Roman Empire, the reign of Charlemagne, the Viking Invasions, the East-West schism, the Black Death, the Renaissance, the Age of Discovery, the Protestant Reformation as well as the Counter-Reformation of the Catholic Church, the Age of Enlightenment, the French Revolution, the Industrial Revolution, the two World Wars, the Cold War, the formation of NATO and the expansion of the EU. Prior to the Roman conquest, a large part of Western Europe had adopted the newly developed La Tène culture. As the Roman domain expanded, a cultural and linguistic division appeared between the mainly Greek-speaking eastern provinces, which had formed the highly urbanized Hellenistic civilization, and the western territories, which in contrast largely adopted the Latin language. This cultural and linguistic division was eventually reinforced by the later political east-west division of the Roman Empire. The Western Roman Empire and the Eastern Roman Empire controlled the two divergent regions between the 3rd and the 5th century. The division between these two was enhanced during Late antiquity and the Middle Ages by a number of events. The Western Roman Empire collapsed, starting the Early Middle Ages. By contrast, the Eastern Roman Empire, mostly known as the Greek or Byzantine Empire, survived and even thrived for another 1000 years. 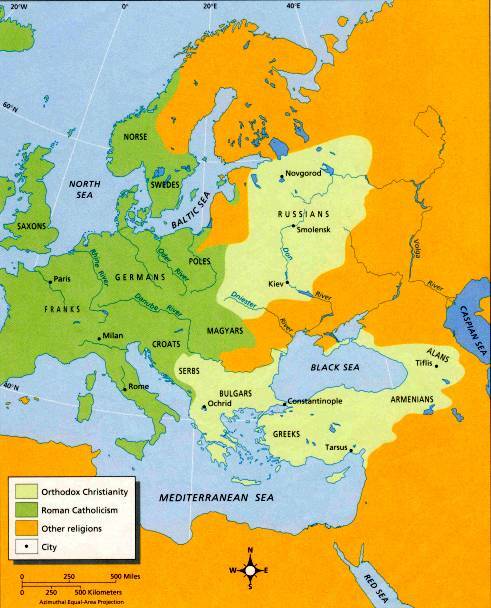 The rise of the Carolingian Empire in the west, and in particular the Great Schism between Eastern Orthodoxy and Roman Catholicism, enhanced the cultural and religious distinctiveness between Eastern and Western Europe. After the conquest of the Byzantine Empire, center of the Eastern Orthodox Church, by the Muslim Ottoman Empire in the 15th century, and the gradual fragmentation of the Holy Roman Empire (which had replaced the Carolingian Empire), the division between Roman Catholic and Protestant became more important in Europe than that with Eastern Orthodoxy. In East Asia, Western Europe was historically known as taixi in China and taisei in Japan, which literally translates as the "Far West". The term Far West became synonymous with Western Europe in China during the Ming dynasty. The Italian Jesuit priest Matteo Ricci was one of the first writers in China to use the Far West as an Asian counterpart to the European concept of the Far East. In Ricci's writings, Ricci referred to himself as "Matteo of the Far West". The term was still in use in the late 19th and early 20th centuries. Christianity is still the largest religion in Western Europe, according to a 2018 study by the Pew Research Center, 71.0% of the Western European population identified themselves as Christians. The East–West Schism, which has lasted since the 11th century, divided Christianity in Europe, and consequently the world, into Western Christianity and Eastern Christianity. With certain simplifications, Western Europe is thus Catholic or Protestant and uses the Latin alphabet. Eastern Europe is Orthodox and uses the Greek alphabet or Cyrillic script. According to this definition, Western Europe is formed by countries with dominant Roman Catholic and Protestant churches, including countries which are considered part of Central Europe now: Austria, Belgium, Croatia, Czech Republic, Denmark, Estonia, Finland, France, Germany, Hungary, Iceland, Ireland, Italy, Latvia, Liechtenstein, Lithuania, Luxembourg, Malta, Netherlands, Norway, Poland, Portugal, Slovakia, Slovenia, Spain, Sweden, Switzerland and United Kingdom. Eastern Europe, meanwhile is formed by countries with dominant Eastern Orthodox churches, including Greece, Belarus, Bulgaria, Serbia, Romania, Russia, and Ukraine for instance. The schism is the break of communion and theology between what are now the Eastern (Orthodox) and Western (Roman Catholic from the 11th century, as well as from the 16th century also Protestant) churches. This division dominated Europe for centuries, in opposition to the rather short lived Cold War division of 4 decades. Since the Great Schism of 1054, Europe has been divided between Roman Catholic and Protestant churches in the West, and the Eastern Orthodox Christian (many times incorrectly labeled "Greek Orthodox") churches in the east. Due to this religious cleavage, Eastern Orthodox countries are often associated with Eastern Europe. A cleavage of this sort is, however, often problematic; for example, Greece is overwhelmingly Orthodox, but is very rarely included in "Eastern Europe", for a variety of reasons. During the four decades of the Cold War, the definition of East and West was rather simplified by the existence of the Eastern Bloc. Historians and social scientists generally view the Cold War definition of Western and Eastern Europe as outdated or relegating. During the final stages of World War II, the future of Europe was decided between the Allies in the 1945 Yalta Conference, between the British Prime Minister, Winston Churchill, the U.S. President, Franklin D. Roosevelt, and the Premier of the Soviet Union, Joseph Stalin. From Stettin in the Baltic to Trieste in the Adriatic an iron curtain has descended across the Continent. Behind that line lie all the capitals of the ancient states of Central and Eastern Europe. Warsaw, Berlin, Prague, Vienna, Budapest, Belgrade, Bucharest and Sofia; all these famous cities and the populations around them lie in what I must call the Soviet sphere, and all are subject, in one form or another, not only to Soviet influence but to a very high and in some cases increasing measure of control from Moscow. Although some countries were officially neutral, they were classified according to the nature of their political and economic systems. This division largely defines the popular perception and understanding of Western Europe and its borders with Eastern Europe. The world changed dramatically with the fall of the Iron Curtain in 1989. West Germany peacefully absorbed East Germany, in the German reunification. Comecon and the Warsaw Pact were dissolved, and in 1991, the Soviet Union ceased to exist. Several countries which had been part of the Soviet Union regained full independence. In 1948 the Treaty of Brussels was signed between Belgium, France, Luxembourg, the Netherlands and the United Kingdom. It was further revisited in 1954 at the Paris Conference, when the Western European Union was established. It was declared defunct in 2011, after the Treaty of Lisbon, and the Treaty of Brussels was terminated. When the Western European Union was dissolved, it had 10 member countries, six associate member countries, five observer countries and seven associate partner countries. The Intermediate Region is an established geopolitical model set forth in the 1970s by the Greek historian Dimitri Kitsikis. Under this model, the lands between the Adriatic Sea and the Indus River form the Intermediate Region, and are considered a bridge between Western and Eastern civilisations. In addition, Australia, Canada, Israel and New Zealand are members of the group, with the United States as observer. The climate of Western Europe varies from subtropical and semi-arid in the southern coast of Italy and Spain to alpine in the Pyrenees. The Mediterranean climate of the south is dry and warm. The western and northwestern parts have a mild, generally humid climate, influenced by the North Atlantic Current. Western European languages mostly fall within two Indo-European language families: the Romance languages, descended from the Latin of the Roman Empire; and the Germanic languages, whose ancestor language (Proto-Germanic) came from southern Scandinavia. Romance languages are spoken primarily in the southern and central part of Western Europe, Germanic languages in the northern part (the British Isles and the Low Countries), as well as a large part of Northern and Central Europe. Other Indo-European languages include the Celtic group (that is, Irish, Scottish Gaelic, Manx, Welsh, Cornish, and Breton). Basque is the only currently living Western European language isolate. Multilingualism and the protection of regional and minority languages are recognised political goals in Western Europe today. The Council of Europe Framework Convention for the Protection of National Minorities and the Council of Europe's European Charter for Regional or Minority Languages set up a legal framework for language rights in Europe. Western Europe is one of the richest regions of the world. Germany has the highest GDP in Europe and the largest financial surplus of any country, Luxembourg has the world's highest GDP per capita, and the United Kingdom has the highest Net National Wealth of any European state. Switzerland and Luxembourg have the highest average wage in the world, in nominal and PPP respectively. Denmark ranks highest in the world on the Social Progress Index. ↑ Ricci, Matteo (1610) . On Friendship: One Hundred Maxims for a Chinese Prince. Translated by Timothy Billings. Columbia University Press. pp. 19, 71, 87. ISBN 978-0231149242. ↑ Dragan Brujić (2005). "Vodič kroz svet Vizantije (Guide to the Byzantine World)". Beograd. p. 51. ↑ Berglund, Sten; Ekman, Joakim; Aarebrot, Frank H. (2004). The handbook of political change in Eastern Europe. Edward Elgar Publishing [via Google Books]. p. 2. ISBN 9781781954324. Retrieved 5 October 2011. The term 'Eastern Europe' is ambiguous and in many ways outdated. ↑ "Field listing: Location". CIA World Factbook. Retrieved 30 July 2017. ↑ UNAIDS, The Governance Handbook, January 2010 (p. 29). 1 2 3 "Europe". Encyclopædia Britannica. 2007. Retrieved 10 June 2008.